Join us Friday, February 22 from 5:00pm to 9:00pm for our Legal-Graffiti fundraiser event during Gallery Night Pensacola, benefitting the Pensacola Alzheimer’s Association. The Alzheimer’s Association, serves Pensacola with education and support as well as raising funds for research. They provide education and support to all those facing Alzheimer’s and other dementias throughout our community, including those living with the disease, caregivers, health care professionals and families. The state of Florida has the second highest incidence of Alzheimer’s. Within the 43 counties that comprise the Central and North Florida Chapter, the Florida Department of Elder Affairs estimates that in 2016 there were 156,643 people living with Alzheimer’s disease. About 1 in every 40 people of all ages has Alzheimer’s disease in Florida. These numbers do not include the snowbirds who reside in the region during the winter months. Make plans to join us to support this awesome local volunteer group. We’ll have music, games, spray paint and more! “Legal Graffiti” is an event hosted at Zarzaur Law during each Gallery Night in downtown Pensacola. “Legal Graffiti” is an opportunity for anyone to make a donation and then create artwork on the recycled billboard vinyl covered side of the Zarzaur Law office building using spray paint. The event raises money for non-profits & charities within the area. Donations are matched by the firm and given to the charity of choice. Recipients include ARC Gateway, American Cancer Society, Big Brothers Big Sisters of NWFL, Manna Food Pantries, Pathways for Change, Autism Pensacola, Emerald Coast Legal Aid, Guardian Ad Litem, Favor House, Favor House and Gulfcoast Kid’s House just to name a few. In the past six years of hosting the “Legal Graffiti” event, the firm has donated more than $100,000 to local charities. Pensacola Personal Injury Lawyer, Joe Zarzaur, has created this blog in an effort to educate the many citizens and visitors of Destin & Pensacola, Florida about their legal rights. 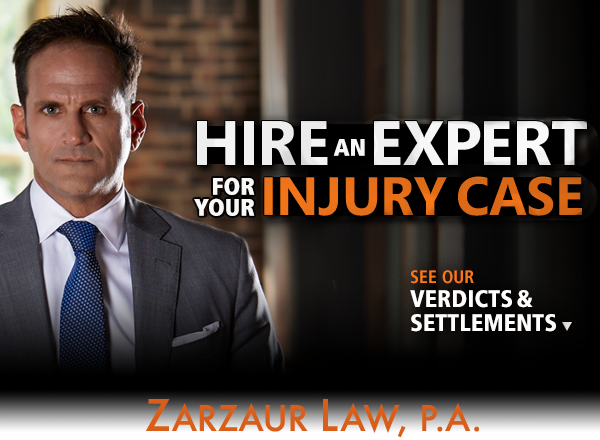 Joe Zarzaur knows the ins and outs of Florida law, and offers friendly-quality legal help whether you have experienced an auto accident, car wreck, have been a victim of medical malpractice or are in need of a personal injury attorney. Back To School and Bus Stop Safety - Do You Know the Golden Rules? Get the legal advice you need from experienced lawyer Joe Zarzaur, hassle and commitment free. All consultations are free of charge and there is NO FEE unless you win. Joe is a pure contingency fee lawyer and only collects costs and fees if he wins the case and the client receives a recovery. If the client does not collect, Joe doesn’t collect either. Read more about Joe's most recent successful case. © 2018 Zarzaur Law P.A.